Over the past several decades, the NRA has positioned itself as the champion of the 2nd Amendment and defender of the rights of every gun owner—at least, that is what they would like the American people, gun owners and not, to believe. In reality, the NRA is nothing more than a blood-soaked lobbying group that is paid by gun manufacturers to support legislation that increases the number of guns that can be sold. They couldn’t care less who buys the guns, just as long as the guns are bought and restrictions to future gun sales are not implemented. To the NRA and their sponsors, massacres, gun crimes and accidental shootings are merely the acceptable losses in the endless race for profit. Currently, the NRA is fighting against federal legislation that would bar convicted domestic abusers who abuse non-spouse partners and stalkers from buying weapons. 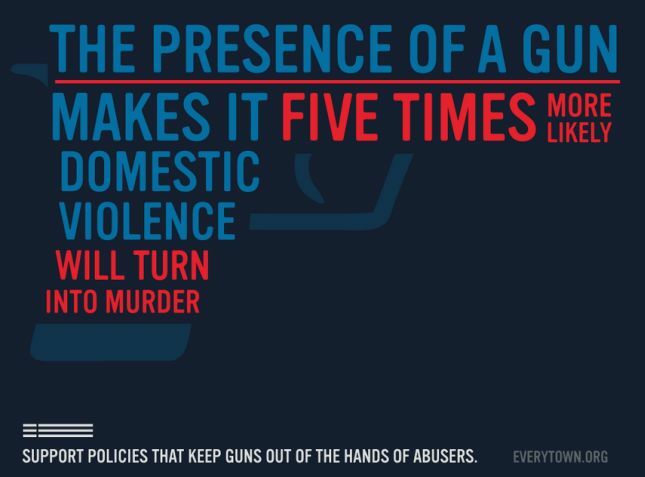 This legislation is extremely important, as gun ownership is a major contributing factor to the lethality of domestic abuse—abusers who own guns are 5X more likely to kill their victims if they own a gun than if they are unarmed. Domestic abuse is rampant in the USA, particularly in the south and areas that are traditionally gun friendly, so expanding the domestic abuse gun ban has the potential to disrupt a significant number of gun sales. This disruption cuts into the profits of gun manufacturers and creates a situation where they must choose between arming abusers and making a little less money. In 2012, after the Sandy Hook massacre, the NRA opposed universal background check for gun ownership, despite the fact that a majority of Americans, NRA members and even gun sellers support such a mandate. The NRA opposes background checks, despite the opinions of the groups who they purport to represent, for the simple reason that the gun manufacturers’ opinions are the only ones that matter. Gun manufacturers make significant amounts of money through selling to straw buyers who can only operate when background checks are not done, thus they have a strong interest in fighting regulation. They know that these guns find their way into the black market, but don’t care because they make money regardless of the eventual destination of the gun. In 2010, an effort was made to ban people on the terrorist watch list from buying guns. This measure would prevent terrorists—whether domestic right wing extremists or foreign Islamic terrorists—from legally buying powerful weapons with which they could perpetrate massacres. Unfortunately, the NRA opposed this anti-terrorism measure and they managed to kill it via threatening to reduce their grade of any politician to support such a law. It is not unrealistic to worry that terrorists might use lax American gun laws to gain access to weapons, as terrorist spokesmen like Adam Gadahn have called for their followers to do just this. Additionally, terrorists like the D.C. snipers and the Fort Hood shooter have proven themselves to not only be adept at killing Americans with guns but far more effective than their ill-fated allies who attempted to use bombs (the underwear bomber ignited his own groin, the Boston bombers only killed three people, etc.). Put simply, the NRA supports selling guns to suspected terrorists, convicted domestic abusers, stalkers and individuals who are either insane or criminal enough not to be able to pass a background check. They serve the gun manufacturers and are simply using low-information gun owners as foot soldiers to fight against sane regulations. To the gun manufacturers, a gun bought by a terrorist who kills a dozen Americans is only differentiable from a gun bought by a police officer in that it’s use creates the risk of more gun control being passed—the profits are exactly the same for both purchases. In order to increase their sales, the gun manufacturers ensure that American criminals have easy access to weapons, and then use their NRA flaks to promote the idea that the solution is always more guns. This creates a situation where the manufacturers not only gain the ability to sell to those who cannot legally buy guns, but they also use the bad acts of these people to fuel higher legal gun ownership (people hear about crime and buy guns for self-defense). If you are a responsible gun owner, you don’t want violent or crazy people to have easy access to guns and have no problem passing a simple background check to buy your legal guns. Sure, such a check may be a little irritating and may delay your purchase by a few days, but it will also reduce the number of times you need to read about children being shot at their desks in school—to me, this is a very small inconvenience for a very large gain. Every person to own a gun and still support sane gun regulation needs to make it very clear that the gun lobbyists at the NRA and other likeminded groups are simply extremists who don’t represent the mainstream. These people must work with the rest of us to isolate the NRA and ensure that they don’t continue to dominate our politics and impose gun deregulation that not even the average gun-enthusiast can get behind. Gun dealers support mandatory background checks ? I would support a law that forced you to pay me $25 to $100 for a single phone call . Manufactures make large profits selling thru straw buyers who can only operate when background checks are not done ? Straw buyers make profits from people who can’t pass background checks being done. Gun shops like background checks because they prevent independent sellers from cutting into their business (ex. At gun shows). Also, a lot of them are solid citizens who don’t like the idea of their community getting flooded with guns that are purchased by people too crazy or criminal to pass the check (their children need to go to school as well). Josh as always you put it together so any moron can understand. I am certain though you will receive dissenters, those who believe their ‘right’ to guns of any caliber and without limitations are by their nature not interested in reasoned discussion. The need to control and limit cannot be more clearly illustrated than if we look at the recent tragedy of the young boy killing his baby sister with the single shot Cricket and the grandmother saying, ‘it was God’s will’. No, you cretin, it was your will, it was the NRA’s will, it was whichever parent bought a 5 year old a gun it was their will, but God had not one thing to do with it. Valentine! There you are. I’m still waiting for you to provide details of your alleged ordeal involving “gun violence” that you claimed to be a victim of on June 4th. Do you even know what a Cricket rifle looks like? Here is a video that you may find interesting. Marie, here is a news flash. I do not owe you my story. If you want my story you are welcome to search my blog where it is written and read it for yourself, it is there. As to the Cricket, why yes I know what one looks like and I know the damage one can do. I think it is appalling they are sold. If you are a supporter of them being on the market and sold to children then you are one of the morons I am talking about. The eleven year old girl in that video (which I doubt you really watched) already has more courage and common sense than people like you will ever have. I guess that you are going to say that the elderly veteran in this video who suffers from Parkinson’s Disease and diabetes and who had recently lost his wife is a moron. Valentine, here’s a newsflash. If you have already posted your alleged experience on a blog, then you should have no problem summarizing it and posting it on this one. Judging by your comments that you have made on this blog, it is pretty obvious that any blog that is ran by you would be nothing but predictable, regurgitated, liberal bile and not worthy of my view. I just had to post this. Here’s one 13 year old girl whose home I wouldn’t recommend breaking into. LOL… the antigunners just keep making stuff up and hope non-thinking people fall for it. I think, after reading this article, I will send another nice big check to the NRA. With out the NRA, people like the person who wrote this article would gain more influence. This world is crazy enough with out that happening. 5 million member of the NRA say your wrong. 5 million members of the NRA say you are wrong. Millions of people watch Honey Boo Boo. Argumentum ad populum doesn’t mean that you aren’t an imbecile–it merely means that you have some company (and the NRA doesn’t have 5 million members, they just don’t take people off of the rolls when they die or stop paying dues). Let’s not forget the millions of others who are not members of the NRA, but do belong to other fine organizations such as Gun Owners of America, Armed Females of America, Jews for the Preservation of Firearms Ownership and the Pink Pistols. You are crazy! There were no facts in this article just opinion. Everytime a gun is used, it hurts the NRA’s efforts (how the hell do you think that helps them?) Last time I checked we have over a few thousand more gun laws then we did back in the 90’s. The reason they oppose those laws is because they don’t require a conviction. You know that whole Due Process thing? terror watch list does NOT equal terrorist. Bring them to court first. Abusers are NOT allowed to own a gun after they are convicted already. What they want to do is take them away when they are alleged. All the cops can and should do, is tell the other person, “Hey, x% of people who are in this situation die from that gun. You should leave this person if they are abusing you, as it can result in your death”. Again there are no facts in this article, just opinions and rants. I think one of the major stumbling blocks of the background check legislation had to do with the required record keeping, which would constitute a registration risk, and there is broad support for protection against that. Taking away a citizen’s civil rights takes due process. Being on a terrorism watch list doesn’t qualify. Here again, the position is strongly supported. Convicted felons are already barred from firearm ownership. We could consider lowering the threshold of violent offenses where convictions have been obtained, and there might be some room for cooperation there. To impose a temporary “gun restraining order” for someone deemed a violent threat, it would be important to document the threatening behavior by filming, recording, and if possible with the support of witnesses. A case would have to be made in court and the accused must have the right of rebuttal. Without due process most gun owners are unlikely to support the idea. Maybe some responsible journalism would be helpful too. This is a complete slander attacked funded by bloombug mercenaries. Your effort to discredit the NRA falls flat and only energizes the base. Liberal politicians will take billionaire tyrant money and make a political correctness push but the majority of American citizens will never give up their rights. The gun control agenda is a small faction of radically obsessed progressive liberal democrats. They try to sound mainstream but it is not true. The real truth is the failed liberal policies in place that leads to much of this violence. I am not alone standing with the NRA. I don’t take money from any gun-control group and would love to see you try to rationally argue slander. Honestly, I pity people like you–so afraid of the world that you obsess over your guns and so ignorant that the NRA has no problem brainwashing you. Please get help. No need for help. The majority celebrates the NRA. It is the only organization standing up to nanny-state tyrants and political correctness nonsense being pushed here. We are not obsessed with guns, we value our freedom and our rights. Whether you like it or not, it is an individual natural right protected by the Second Amendment. The thing is there is such a huge disconnect between the parties involved here. I grew up my entire life on a farm and still live here. If your car broke down on the road, We would invite you in for some tea and homegrown tomato sandwiches while you waited. You paint all gun-owners as the same and it is just not true. Millions upon millions of us grew up as kids not with Fenway Park on our minds but the next deer rifle or shotgun. We are not your enemy but you treat us as such. It is really sad that the political forces here divide the country to drum up the vote. You lay blame to millions upon millions of good, honest Americans doing the right thing everyday with articles like this. As the NRA says, We are the good guys. Obsessing over guns? You have a web site with a second amendment category and someone else is obsessing over guns? Try to argue against this. You simply don’t live in reality if you believe any of that. Care to provide proof as to what part he is wrong about? Making statement of opinion is not proof btw. The actually survey question if you do the research was “Do you think there should be background checks before a gun is sold” The survey never said anything about universal background checks. And NRA members were never surveyed. The majority of american’s reject your liberal ideas. We will take back this country from the worst president of all time in 2 years. And the way Obama is breaking the law on a weekly basis, I don’t think he will end his term without impeachment or imprisonment if we get the rest of congress back in the next election. At this point, the supreme court has ruled against him 11 out of 11 times. He is the biggest piece of trash to hold political office in this country. 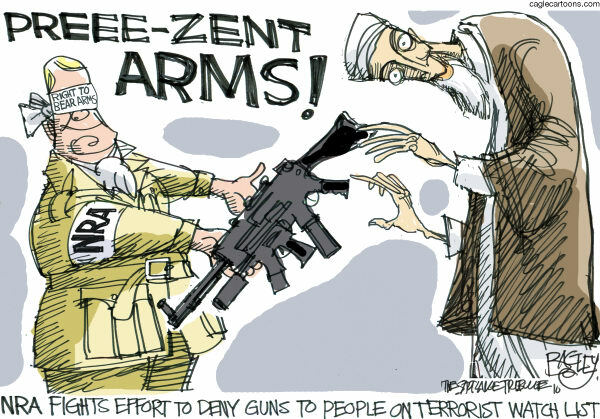 The ACLU & the NRA are in complete agreement about so-called “terrorists”. Hold up.. The implications in this little article are morally abhorrent. A terrorist watch list is not grounds to suspend any individual rights. If you are not charged with a crime, a clandestine watch list is not sufficient grounds to to be denied any rights. Ted Kennedy was on the no fly list several times.. The point is, having your name on some secret list is an argumentum ab auctoritate fallacy. As, by simply having your name on a list via an authority’s suspicion does not make you guilty of a crime. This absurdity that opposition to this breach of the fundamental right for a fair trial is a back mark on the NRA is ludicrous…. Is the indefinite detention of suspected terrorists in GITMO the sort of policy the NRA should be backing to reassure you? Let’s not forget that your little rallying cry at the end is completely hypocritical. You are going to say that the manufacturers are to blame on this, and use the power of government to correct this injustice. You are going to use the coercive power of the the LARGEST ARMS DEALER IN THE WORLD to stop the “blood money” .. 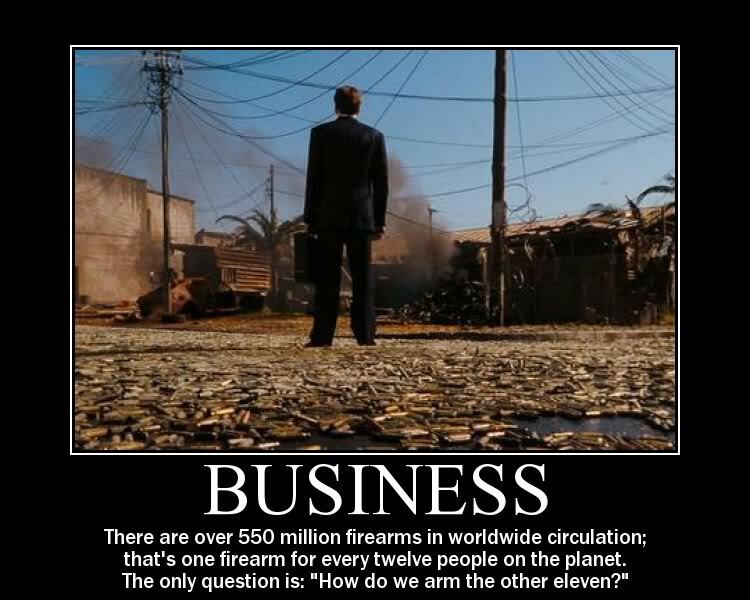 So, we are going to continue to funnel greater profits to an organization that profits the most in world wide blood money in order to maybe, possibly, kinda quell straw purchases if prohibited buyers agree to take a background check. The ATF cites that nearly 50% of all guns used in crimes had come from straw purchase. The issue here is that straw buyers are already well aware that they are breaking the law. While the same ATF statistics show that only 1.2% of illicit firearms come from crooked dealers. Now, that being said, how much money would firearm manufacturers make from the sale of illicit guns? For all the homicide, and suicide in one year, gun manufacturers stand to make an additional 0.3% profit, split between all manufacturers. This is on the condition that all the guns used in homicides,or suicides had been purchased new that year. Essentially, if you removed all the profits from every single gun used to kill a human being in a year, the entire firearms industry would only loose 0.3% profit. 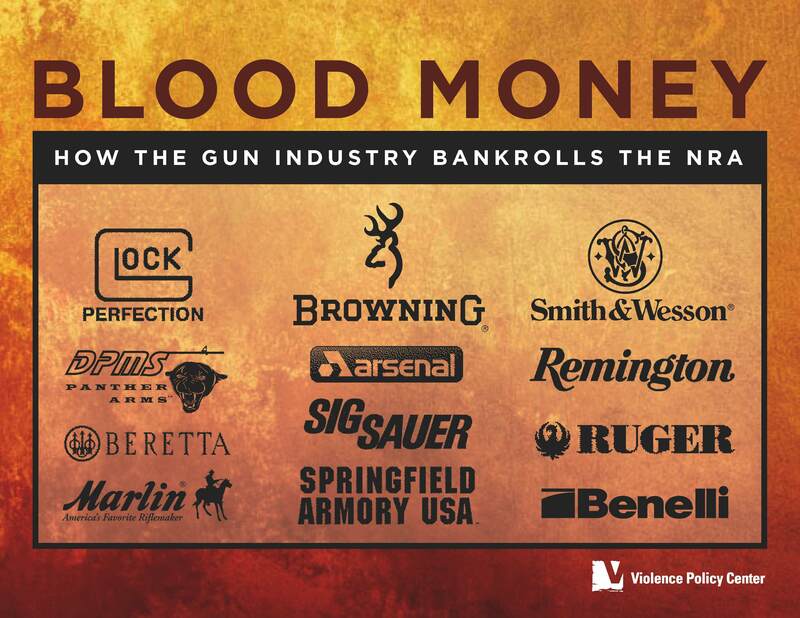 With over 10,000,000 new guns made every year, a cost averaging around 600 dollars a gun, and over 5,400 manufacturers in the US, that would mean each company that makes a gun only receives at the very most $333.33 a year in blood money if the guns had been purchased that year, and the blood money was split only by average domestically. It would seem blood is not as profitable as you lead on. Nothing in that article matters, it’s just a silly anti-gun political rant and propaganda piece that nobody believes or pays attention to anyway. FROM MY COLD DEAD HANDS!!! I’m a clinger with the pro-gun crowd. Why don’t you and Bloomberg keep your anti-gun nonsense confined up north? Nobody else is buying it. I was arrested for my Fl carry permit violation in NJ and still no pardon also i was told if i continue to ask for the dash video that shows i was profiled and harrassed by the trooper that my PTI would be revoked. When i called Chris Christies Aide phone line an aide named candice told me that i may have to wait until his last day in office because thats when he signs pardons and also that shaneen allen were pardoned quickly because they had media attention so that leaves me alone in this NRA wont back me because i have a “offensive” tattoo lol i have same lawyer as shaneen did Evan Nappen he is weak and told me that the state can take back my PTI just for asking for my dash cam video. I want the video to show that the police lied for his reason to stop me that i was stopped because i had a gun sticker on the back window that was it also when i was atopped the coward cop hid behind my 3 year old son terrifying him with his gun drawn my son kept saying im scared im just a kid and such this cop should be fired and the video should be released to show anyone that even accidentally crosses into that horrible state could become a victim by the police and draconic laws. I thought maybe you may like to look into my case. I do intend on getting the tape as soon as my pti is over and i cannot be threatened by the States attorney any longer. Thanks my Name is James Gotti my stop occured in Hunterdon NJ i was stopped on hwy 78 mile marker 14 by state trooper English on october 17 2015 aprox 9pm my email is jgotti28@gmail.com my number is 7278514987 thank you for your time and concideration.